When I was a teenager, I was a huge fan of the Metal Gear Solid series. I completed Sons of Liberty and Snake Eater about seven times each, and finished both of them on European Extreme difficulty. I knew every nuance of every character, could quote along to the script with the best of them. I was in love with the world, the music, the entire aesthetic and drive of the series. I had a group of friends who played the games with me. Sometimes we’d go round each others houses and spend 17 hours straight completing one of the titles, or just playing around with the goofy guardsmen. We’d have hours and hours of discussion about the lore, wonder who could play the characters if there was ever a movie, dream of writing the officially licensed novel for the series. It was a beautiful time. But then something weird happened. It was announced that Metal Gear Solid 4: Guns of the Patriots, the chronological sequel to Sons of Liberty and concluding chapter in Solid Snake’s run, was going to be a PS3 exclusive. By this point I already had an Xbox 360. I certainly didn’t have the money to buy another console or even trade in (back then, PS3’s were nearly £500.00). 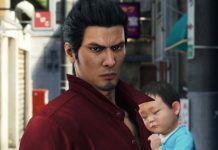 I just had to accept that Metal Gear Solid 4 would be ‘the one that got away’, which is also how I would come to view Demon’s Souls in later years. Eight years later, Metal Gear Solid V: The Phantom Pain came out, and once again I plunged into Hideo Kojima’s familiar world of epic narrative, beautiful cinematic story and the beloved characters I’d come to know so well. Imagine my delight that Ocelot keeps his place, being the only Metal Gear Solid character to appear in every title. And though it was a more open-world experience with less cutscenes and more optional storytelling through the cassette tape system, there were still all the familiar touches of the franchise that made me fall in love all over again. And made me wonder about the one that got away. Miraculously, I’d managed to avoid spoilers for the series. I had no idea what had happened to Solid Snake after he went after the Patriots, only, that it was ‘emotional’. That was the word that kept being bandied about. I loved Big Boss – and revisiting his character years after the incident with the Cobras was sensational – but it was always Solid Snake who spoke to me most, who was the archetypal hero. But it felt weird rethinking about this old hero from my past – because times had very much changed. I was no longer a teenager – I was now living in a different city, with my partner and making a living for myself and those friends I once saw so often were gone. We were all different people. There wasn’t anyone I knew who I could call up for a chat about Solidus Snake or the plan to brainwash Raiden. We’d moved on. I’m not a nostalgic person, but suddenly I found myself pining for those simpler times. The thing is, as a writer, stories are always the most important thing; they throb at the forefront of my brain like an oncoming lightning strike – the forked spike of electricity the moment of inspiration. I hold on to stories, I memorise them, I internalise them. And I realised, playing The Phantom Pain, that one story had never quite let go of me. I needed to finish it. I needed closure, not just on the game, but on my own story, the story of that person I’d been all that time ago. I was doing it for my friends, I told myself. I was honouring the memory of that special time. Rationally of course I berated myself: it was stupid and a needless expense, but it didn’t stop me asking a buddy if they had a PS3 they didn’t mind selling. My friend was all too happy to shift some dead-weight – along with MGS4 thrown in for good measure. I got a sweet deal, and suddenly, I found myself with a PS3 – I’d made the ‘leap backwards’ to quote another friend. I was still telling myself it was stupid right up until I put that disc into the dock, and then I realised, I had made the right decision. This series was part of the sweetest of all childhoods, a blessed time of unadulterated creation. 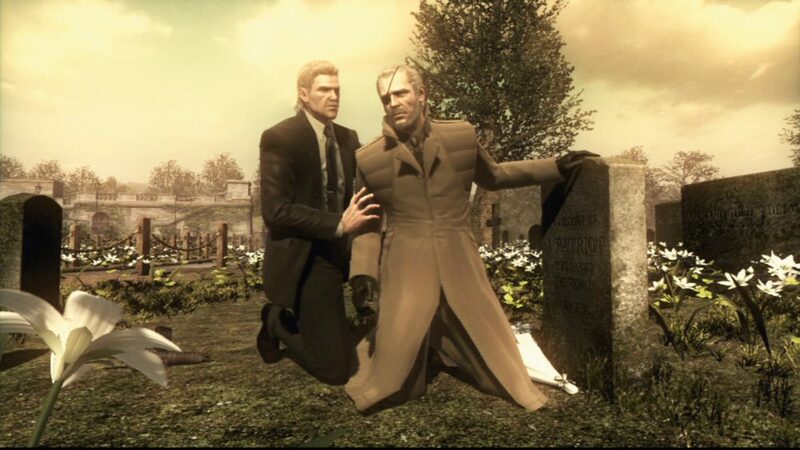 Fittingly, Metal Gear Solid 4, with its frequent prompts to receive flashbacks throughout its lengthy cutscenes, is, in itself, a meditation of memory, the kaleidoscope of a life and the lives that have gone before it all culminating in something meaningful. That time, my blessed childhood, had come to a natural close, and though I certainly hadn’t stopped being creative, I hadn’t managed to let go of those easy times with friends. Who, as an adult, just pops round the corner to their mate’s house for a day of Xbox? I knew I wouldn’t ever let that go, not until I finished Guns of the Patriots. Not until I saw Solid Snake through to whatever end awaited him. 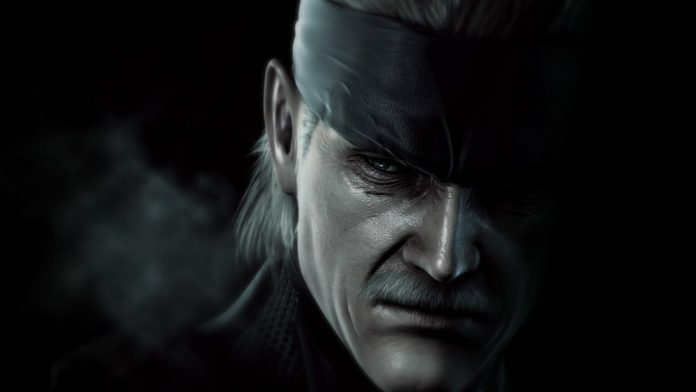 Nine years on, Metal Gear Solid 4: Guns of the Patriots has not dated. Sure, graphics have moved on, but this is more than made up for by the astonishing character designs, cinematic lighting and Kojima’s confident ‘camera work’. The gameplay is one innovation after another, relentless through all five sweeping, epic acts. In act two, Liquid Sun, we move from stealthy infiltration, to an elaborate tracking section which involves analysing everything from the depression of a footprint to the shape of the foot. We transition into an action-orientated segment in which we must fight alongside the rebels to infiltrate Liquid’s PMC base – surreptitiously sniping enemies from concealed positions to facilitate the rebels’ victory. After that, we enter a driving section, where we must fight brain-damaged PMCs, reeling from a nanomachine attack, who, like zombies, try to climb onto the top of Drebin’s armoured vehicle and rip you apart. You take them out with a turret. The next Act, Third Sun, opens up Bond-style infiltration mission in a European city. Kojima never allows us to get stuck in a staid routine, and that is why, good though Phantom Pain is, it is nothing next to Guns of the Patriots, because it is essentially limited and repetitive in comparison. To be fair, Kojima’s original vision of Phantom Pain was more expansive and he was hampered by both his deteriorating relationship with Konami and the shift in the Japanese video-game market towards mobile gaming. But the problem is more widespread. We have all felt a change in the air, but perhaps not fully articulated it. Phenomenal games are still being made, of that there is no doubt, but playing Guns of the Patriots reminded me of just how content-rich the titles of earlier console generations were. There was a reason I could play Snake Eater seven times through and not tire. It may have only been a PS2 title, but there was so much to do, to discover, to unlock, and there was so much variety in terms of the actual gameplay. There were about 5 ways to escape from the prison in Grozny Grad, each as satisfyingly esoteric as the last. This is something I certainly feel has been lost in our current offerings, as much as I’m fond of many of the big AAA titles that have been released late 2016 / early 2017. I can’t imagine myself playing Gears of War 4 seven times through, but no sooner had I finished Metal Gear Solid 4 I wanted to give her another spin. It’s also about story. Guns of the Patriots is one of the greatest pieces of storytelling, I would argue, of all time, regardless of genre. 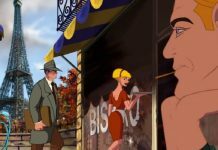 I know it’s a big claim, and I’ve already told you I’m biased with the childhood connection, but hear me out. 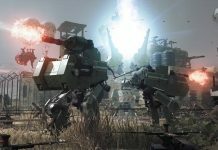 Yes, it is bombastic and wildly over-the-top, but that is part of the universe of Metal Gear Solid, a given we accept in the same way we accept outlandish science fiction technology in the Star Wars movies or the existence of magic in a fantasy film. Solid Snake’s journey towards his inevitable destiny and act of transcendent self-sacrifice, going where no one else dare go: into the microwave corridor, is more parallel with The Odyssey or The Iliad, the epic canon, than any video-game. Even the five act structure itself is a nod to the theatrical traditions of epic Tragedy and the work of Shakespeare. Metal Gear Solid 4 remains, however, a modern epic: interactive, technological, and, despite the advent of post-modern meaninglessness, a re-definition of heroism. The microwave corridor scene is perhaps the most powerfully emotive scenes in all of gaming. It is emotive not just through its storytelling: the incredible 24-style splitscreen which shows the crumbling defence of humanity against Liquid’s onslaught, the tragic Arabic love-theme, and the sight of our hero literally falling apart at the seams, determination the only thing keeping him going. These things are more typical of the traditional epic: scope, pathos, grandeur. No, the modern aspect, and the true genius of the scene, is the integrated button-mashing, which makes us complicit in Snake’s struggle, makes us part of his desperate attempt to fulfil this final act. 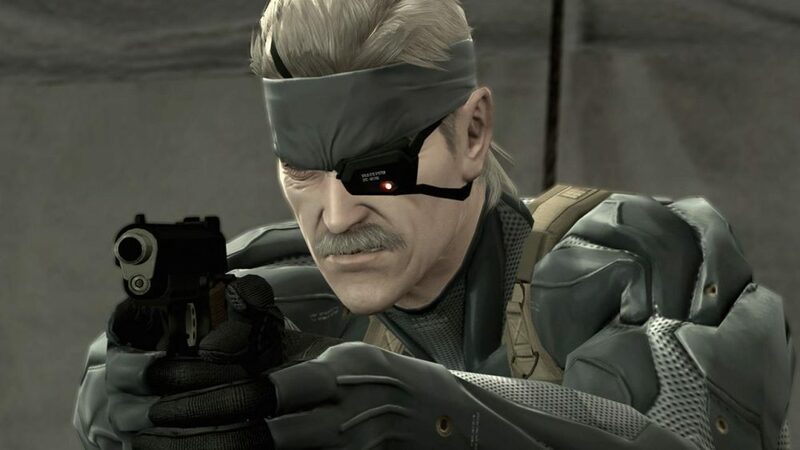 We, as players, become exhausted with him, crushing the triangle button over and over, urging Snake: just a little farther, just a little farther. I found myself, regardless of the nine year gap, screaming at the top of my lungs. I was almost angry at Kojima. I accosted him: don’t make me watch my childhood hero die like this. But, at the same time, I recognised it is the very desperation of that act which makes it triumphant, the very despair that raises it above all others. Kojima spends most of Metal Gear Solid 4 tearing down the Solid Snake we have come to know and love. Werner’s disease has prematurely aged him, robbing him of his Clint Eastwood good looks. But it’s worse than that: it’s also deteriorated his musculature, meaning he needs a muscle-suit to ‘get around.’ Otacon accuses him of senility. Meryl no longer loves him. Naomi is repulsed to even look at his corroded body. 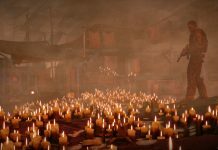 He becomes merely a ‘legend’, something remembered of the past that has no purpose left. Even Raiden, now, is the superior of the two, no longer the rookie who needs coaching. All of this is only to make that moment in the microwave hall all the greater, all the more agonisingly victorious, all the more beautiful. He doesn’t put himself through that torturous, almost certainly mortal trial for the approval or adulation of others. No. He does it to preserve the very ideology of what makes us human. Liberty. Freedom. Beauty. 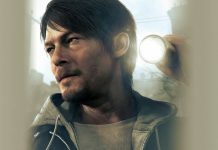 The genius of it is that Kojima, while embracing all things bombastic – cyborg ninjas and outrageous action – never makes the mistake of spelling out the true, deeper meaning of things. If he did, they would lose impetus. 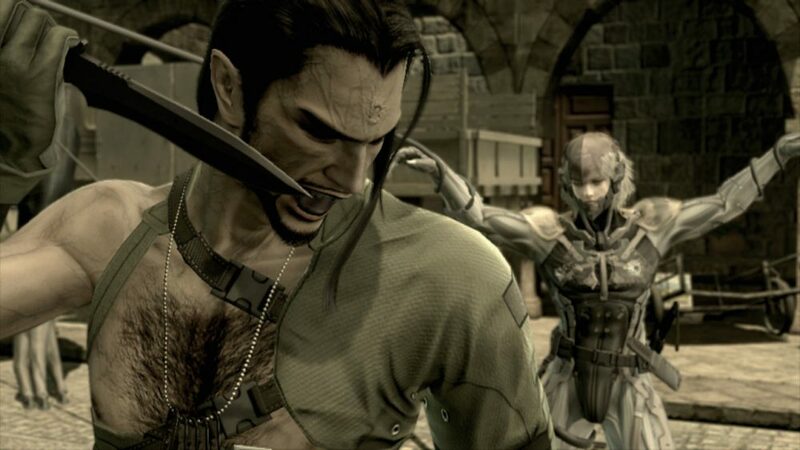 Yes, Snake survives, in the end, and gets the brief flickering happiness he surely deserved, but none of that takes away from what he was prepared to do – did do. Games have come a long way. I can’t deny that. But, once in a while, developers could do with looking back at that microwave hall, at what it meant. Coming back to it after all that time and damage quietly changed my life. Or else, allowed me to recognise my life had changed, and accept it.